Music has the power and warmth to truly thaw what has frozen in our hearts. It wards away all the stony bitterness to become a balm for our souls. 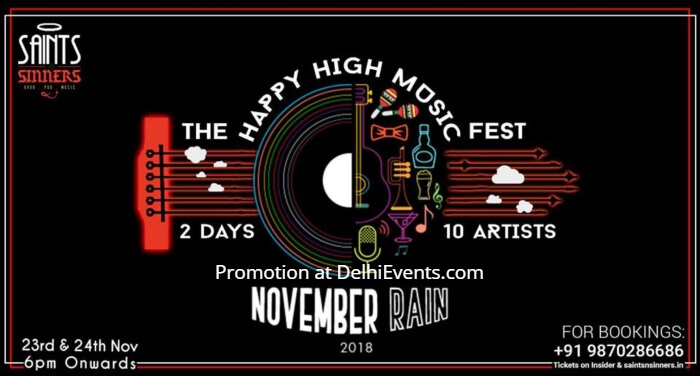 This feeling of contentment and comfort is where the November Rain Music Festival is born. On the occasion of Saints N Sinners’s one year anniversary, we are celebrating a two-day festival filled with the magic of good food, drinks, music and company on the 23rd and 24th November. An unforgettable experience awaits you, where musicians from all corners of the country are coming to celebrate our special milestone. We celebrate our special milestone with a tribute to the greatest remedy of all time, loved by saints and sinners alike.